Welcome to Alumni Spotlight, a blog series focused on our alums – where they’ve been and where they are now. 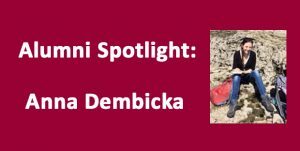 For this installment we interviewed Anna Dembicka. 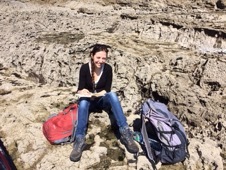 At Cardiff I studied for a two year MSc in Conservation Practice. My undergraduate degree was in English Language and Literature several years earlier so this was a big step for me to take. I did not pursue any more formal education after finishing at Cardiff but I am currently doing an ICON internship in ceramics conservation and am learning lots on the job! What was your education and experience in conservation like before you came to Cardiff? Before Cardiff I did a BA in English Language and Literature at the University of Liverpool, so a complete change of careers! I worked as a teacher for a few years but also studied a module in archaeology of Roman Britain (distance learning for a term), which perhaps helped show my interest in heritage when I applied to Cardiff. The fact that the MSc in Cardiff was a two year programme is what swayed me towards it, as I really needed that extra year to retrain! Since graduating, I have had to go back to doing my old job teaching English but volunteered as a conservator at Bolton Museum to stay in practice and keep learning. Nearly two years after graduating I applied for and got a 6-month ICON Ceramic Tiles internship, which I’m still doing now and enjoying it very much! I am hoping that this will be my first step towards becoming an accredited conservator. Do you still use a portfolio? Have you found portfolios to be useful in your job searches? Yes, it was really useful! I brought it to both my job interviews (it was requested that I do) and it was great to already have something ready and not have to panic to quickly put something together. Also, Jane gave us all feedback on our portfolios so we had a chance to make them better before showing them to a potential employer. Once I’ve finished my internship, I’ll just update it and keep the same format. In short- very useful indeed! 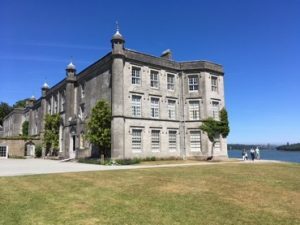 I have worked on lots of interesting projects, including some whilst still in Cardiff uni, but I’d probably say that the architectural conservation projects have probably been the most exciting due to their scale, complexity and historical importance. The first was wall painting conservation at Llancarfan church, which presents a fascinating example of a medieval painted scheme, and the second is my current project involving tiles conservation on a 1930s Jewish butcher’s shop front in Liverpool. This has been brilliant and highly instructive as I am involved not only in the removal of Portland cement from the backs of the tiles after they have been lifted from the walls (see pictures below) but also general conservation, and finally, remounting and displaying at Liverpool Museum. My Cardiff degree has given me a solid base, theoretical and practical, in understanding a range of materials and taking into account a variety of considerations, from time management, through ethics and preventive care of objects. I am now able to build on all this in my work and specialise. It has also given me a taste of working in a museum whilst doing my summer placement and that in turn allowed me to renew that contact when I graduated and join the conservation team in the same museum as a volunteer and learn even more. What I liked most is that doing a degree in Cardiff encourages students to become independent thinkers and critics- a transferable skill, which will be useful no matter what career path graduates choose to take after leaving. It takes time to specialise after graduating but with that solid base, it is easier to adapt, learn and develop. The strong ethical conservation background also allows the graduates to become valuable ICON members and makes it easier later when considering becoming an accredited conservator. It would have been great to be able to specialise more towards the end of the degree, but that would require the department to expand considerably, which may not necessarily be possible. Yes, it was really useful! I brought it to both my job interviews (it was requested that I do) and it was great to already have something ready and not have to panic to quickly put something together. Also, Jane gave us all feedback on our portfolios so we had a chance to make them better before showing them to a potential employer. Once I’ve finished my internship, I’ll just update it and keep the same format. In short – very useful indeed! I haven’t updated it for a while but it still has a couple of (hopefully) interesting articles in it, and more to come once the tile project is completed! Thanks again to Anna for sharing her experiences with us. Wishing you the best with your ICON internship, and whatever comes next!